Tacos are a favorite with our crew. Not just tacos, I mean all things related to the humble taco. Crispy tacos, Soft Tacos, Taco Salad, and even Taco Soup. With a family of 8, it can be tough to stretch that pound of hamburger as far as it needs to go to feed everyone. With teenage boys, it’s even tougher. If you’re like us, then you need to stretch your grocery budget. With meat prices on the rise, family food budgets shrinking, and the kids still just as picky as ever, we sometimes have to get a little creative to make mealtimes work at our house. When I was a kid my mom would extend the ground beef by adding TVP. Umm. Yuck! No offense mom but texturized vegetable protein from the 70’s left a lot to be desired in the texture department. If you aren’t a child of the 70’s or 80’s just imaging those little rubber bouncy balls ground up and added to your taco meat. It did take on the taste of whatever flavorings you used for your dish but there was no hiding that icky texture. I’m pretty sure the TVP has improved over time because it’s still on the market with lots of variety in flavorings. But you won’t find me using it at my house…I think I must have been traumatized by TVP as a child. Remember those picky eaters I mentioned above? If there is a ‘green thing’ visible in the dish it might as we’ll be horse manure as far as getting them to eat it. So, I have to get a little creative with my bunch. 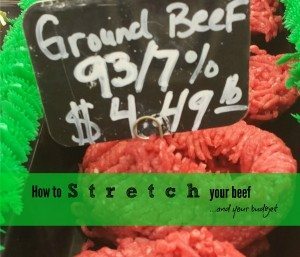 Stretching ground beef has become a bit of a challenge, but over the years I’ve landed on a few things that work at my house. The following list is by no means all inclusive. In fact, I’m sure that there are dozens of other ways to extend ground meats but I’m a little on the lazy super busy side. I’m all about easy, convenient and fast. Oatmeal – Yes the humble oat. I use Quick Oats or Rolled Oats interchangeably. It just depends on which #10 can the child fetched when I sent them after another can of Oatmeal from the food storage room. You can use the plain oatmeal as is, or if you are like my family and the oats can’t be recognized for their true selves…blend away. We end up with an oat powder that we make into a paste. The paste is added as beef is browning, about half way through the cooking time when there isn’t much pink left. Potatoes – The execution of this one depends on the pickiness of your family. I’ve diced up frozen hash brown shreds, they are pretty small and blend well, but for the uber picky, the potato form of choice is potato flakes. I buy them in bulk but you can also get them in the grocery aisle. These are the ones we use to make mashed potatoes. These are very forgiving, sometimes I sprinkle them with the ground beef as its browning and sometimes I mix them into a paste first. These work great as a soup thickener too. Just add water as needed. Dehydrated Re-fried beans are, by far, my favorite ‘stretcher’ for taco meat. Beans naturally go with Tacos so there’s nothing weird or foreign here. Add the beans (they look like dark cornflakes) as the ground beef is browning. I add these early on so they have time to rehydrate and I then add additional water as needed depending on how it looks. The main thing I LOVE about these three is that they’re all shelf stable items just hanging out in the pantry waiting for me. They all have very long shelf lives and I don’t have to worry too much about rotation. 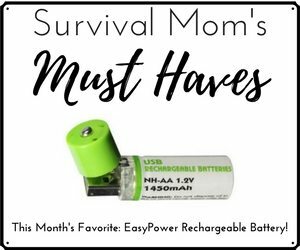 Viewing shopping as an annual activity, not weekly or even monthly one, has really helped me. When it comes to rotation and babysitting food items, I have enough to worry about just making sure the milk doesn’t get chunky or the cheese doesn’t develop green fuzzies. Who really needs one more thing to keep track of? I’m curious if any of you were also traumatized by TVP from your childhood? If so, have you recovered? 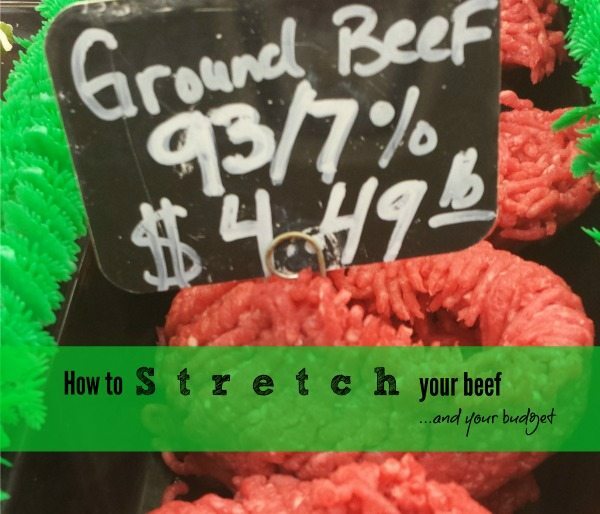 Excellent article on the meat stretchers – and that photo might be a stock photo, but I wish I could get 93/7% ground beef at that price! We use refried beans as a separate “choice” for the taco fixings, but I usually mix mine half-and-half, just because I think it adds to the taste. I love the oatmeal idea, will have to try that one. Dehydrated refrained beans?? I have never heard of them. Do you dehydrate the refrained beans yourself or do you buy them dehydrated? Please educate me! Sorry, auto correct strikes again! Refried beans. Even tho my DS is 13, I still use the babyfood grinder. I grind up cooked beans to blend with ground meat to make it go further. Also, lentils in the taco meat work well. I use cooked whole beans, usually black or brown. Luckily, my kids LOVE beans of any kind so they actually prefer it this way. I’ve also used cauliflower, zucchini, carrots or mushrooms. Either chopped really small or shredded. The trick I’ve found is to add extra seasonings. Paprika helps disguise the color of the vegetables. chopped tomatoes, well drained, can take up a lot of tasty room. TVP —Yuck! I use wheat in mine. Simmer the whole wheat grains until tender and mix into taco meat. I’ve also made Mexican flavored rice and mixed that in or as a side add in. Drain a can of kidney beans to add also..
C’mon is this a survival site or what? How could wheat berries not have made the list? For a few years now it a given that taco night is lentils and wheatberries. Thanks for the article. I haven’t had dehydrated refrieds avilable locally for about 12 years now. I did like those! I also use refried beans as one of my main taco fixins. We love em. My son made me the absolute best burrito I’ve ever eaten using rice mixed with the meat. omg! I’d never thought of adding rice before that. Now it’s just a given. We also mince onions and throw in whole black or pinto beans sort of like a chili rather than trying to make it like pure ground beef. We use plain unflavored soy protein powder works and also regular unbleached wheat flour. blend in an egg can help it firm up properly. Where do you live that your prices are so ridiculously expensive? A cringe appeared on my face when you mentioned your tofu trauma…so sorry about that. Maybe we could start a support group for people affected by childhood food trauma (TCFD) 🙂 traumatic childhood food disorder…kidding of course…or not. My mother’s standard, before we heard of tacos, was oats or grated potatoes. I was never subjected to TVP or tofu. 😉 But I have also used crushed potato chips, barbcue chips, or,if desparate, what ever unsweetened cereal I might have laying around. I might try the re-fried beans tho’. I had never thought about those. Oh, and just as an afterthought, Zaycon foods has 93/7 for 3.99 a pound until, I think, July 21st. but you have to purchase 40 lbs at a time. If they have a drop-off point near you that might be an option. They are online. Wendy, I have heard of Zaycon – when last I looked them up, they hold “events” in a town about 40 minutes from me – but that was a year ago. They may have added to their schedule here since then, though. When I finally get a dehydrator, I’m sure Zaycon will be my go-to for ground beef – I just don’t have the room for that amount of beef in my small chest freezer right now. But thanks for the reminder! Andrea, I’m in the Pacific NW, outside of Portland, OR. (When I moved here from Maine, I had severe sticker shock trauma from the cost of groceries!) Being that this weekend is the 4th of July, ground beef is on sale – 90/10% is $4.49/lb, and 80/20% is $3.49/lb, but we have to buy it in a 3-lb chub. So I’ll be buying some ground beef this weekend, as that’s the lowest price I’ve seen in 3 months – seriously. Thanks for the laugh, and you gained a reader! I was going to mention about Zaycon so I’m glad Wendy brought it up. I LOVE Zaycon! Their chicken especially. We are big chicken eaters and not so much ground beef. 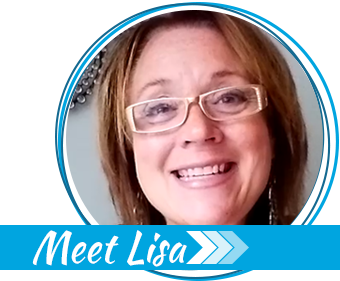 (My husband has issues with ground beef, something about a bad experience as a child, I don’t dare delve much deeper into that…too scary 😉 ) My next article for Lisa on this site is all about bottling meat and why you should do it. Your small chest-freezer issues (you’re welcome for the hyphen) would be solved with bottling. So watch for that. You don’t have to bottle 40 lbs at a time but it sure makes you feel accomplished when you do. ps: Thanks for the visual regarding your cat…just glad I wasn’t drinking anything at the time I read it. You lucky girl you to have missed the TVP and Tofu trauma. You can be an honorary member if like though. Thanks for mentioning Zaycon. What do you do with your bulk purchases? Split with a friend, freeze, process, neighborhood BBQ? 🙂 Also, what has been your favorite Zaycon food? I get ya MikeM, I really do. I have wheat berries stacked on top of wheat berries at my house but there was a time that I didn’t know what a wheat berry was. There are a couple of reasons that I didn’t include them in this article. 1. 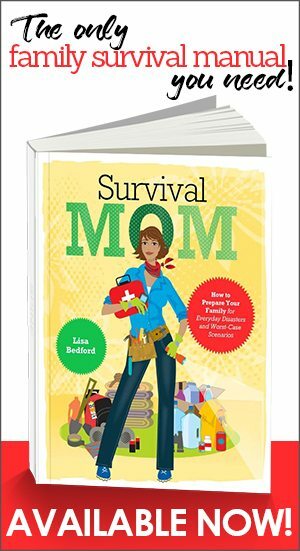 The Survival Mom is a site for people at all levels of preparedness (not just the ones who know what a wheat berry is 😉 ) FYI if you don’t know (not you Mike, but others reading), it’s just another way of saying ‘wheat grain or wheat kernel. 2. My kids know what wheat is and they don’t believe it belongs in tacos. For the record, neither do I 😀 Remember at my house it has to be ‘normal’ (or at least look normal) or they won’t eat it. 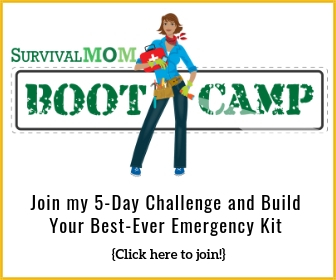 The reason I blog is to help get people to START thinking about being more prepared and move in that direction. You, and many others are at a different stage, like me but if we started them there, they’d get overwhelmed very quickly and quit…and that doesn’t help them get to where ‘we’ are. So that’s why I didn’t include wheat berries. That said, If I can find a recipe that includes them and no one can tell…well then…I’m all in! GREAT ideas! I’m taking notes. Thank you for sharing! I find dehydrated refried beans at my local WinCo. No reason you could not dehydrate them yourself though. Get a good deal on canned refried beans, portion the beans out or use the entire can. Smooth them onto a fruit rollup sheet for your dehydrator and dry away. When you package them, be sure to mark how much they should make. For example: if I portion them in 1/2 cup sections, then I would mark my bag 1/2 cup. Then, when I want to rehydrate them, I place the dried beans in a measuring cup, add hot water to equal 1/2 cup. Let them rehydrate and add additional water as needed to make sure it all adds up to 1/2 cup. I use potato flakes to stretch or thicken many things.from ground meats to soups and gravies. I find them easier to work with than corn starch or flour sometimes. Cooked rice is a great meat stretcher as well. And here’s a trick I learned…well..out of nothing more than just not having the right tool at the time…if you have a pastry cutter in your drawers, it works great to chop your ground meat as your browning it. You can get a much finer (smaller) chop which helps stretch the meat a little farther as well. We are a family of 6 with 2 big male eaters so I have gotten good at stretching ground meat. For pasta sauce I watch the clearance rack at our grocery store for mushrooms. For some reason Ralphs tends to have them marked down sometimes to .99 a package. When I go to brown up the ground beef or bison I add in mushrooms I have chopped up well. They brown up with the meat and if I chop them small enough no one knows they are there. They are sure in my family they do not like mushrooms. If they only knew. For Tacos I do not even try to hide it. I take 1 pound ground meat, 1 canned diced tomatoes, 1 can chili beans and some corn either frozen or canned. I brown off the meat then add in the rest and the seasoning and just let it simmer down. When I used packaged Taco seasoning (cheap with coupons) I do not add the liquid it calls for since I have added the liquid from the tomatoes and the chili beans. We do not do TVP or Tofu but find ways of adding veggies and healthy items to stretch meals. Dinner at our house has to feed 3 adults and 5 to 8 kids (depending on how many friends or cousins are there that night) and I refuse to use more than 2 lbs of meat for any meal. Tacos at my house are always made with 1/3 meat, 1/3 rice and 1/3 re-fried beans. It doesn’t matter if we are using hard shell or soft tortillas or if they are ground or shredded beef, shredded pork or shredded chicken. None of my kids really like lettuce, diced tomatoes or onions unless they are in homemade salsa. So when they were little I just started making them have a layer of beans (I put homemade taco seasoning in the beans too) and a layer of rice on all their taco/burritos and now they think it should always be like that even their friends! lol My only family member holdout is my mother she still refuses to put rice on her tacos or burritos. So I told her that until she does it like we do she is limited to just one. Hahaha she just pouted and said “but I like it my way” lol.